We promote cultural exchange between Germany and Cameroon. We initiate film series, exhibitions, concerts, seminars and festivals which involve bilateral artistic production, reception and reflection. Between 1884 and 1916 the territories of Cameroon were part of the German Colonial Empire. The Goethe-Institut Kamerun supports acitivities that help to bring more light into this episode of common history. Internet editors of the Goethe-Institut have followed the 200 year-old footsteps of the Brothers Grimm through 19 countries on four continents; they have collected modern fairy tales: urban legends. Urban works of art, musicians and public performances, fashion trends, festivals and other artistic activities … All that can equally be found in the streets of our cities. 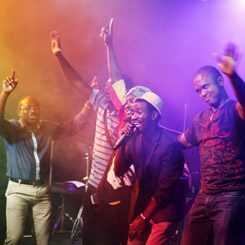 Initiated by the Goethe-Institut The ‚"Découverte" platform is designed to provide young, talented Cameroonian artists with an opportunity of presenting their artistic talents and meeting with eachother. On 2015 we started the very first Science Slam contest in Cameroon. Several candidates met at the Goethe-Institut to present to the public their various scientific topics on a funny way. Meet some of the people that we're working with – short, sweet and to the point.